Battery-powered leaf blowers have been among the most popular and best-selling cordless tools in the US since the advent of home and garden battery technology. Due to this fact, there is now an enormous selection of different devices, batteries, chargers and other accessories. For the usual home gardener, it is difficult to keep track of the current state of new developments and offers today. Therefore, it was a duty for us to finally perform a comprehensive tool review in order to determine the best cordless leaf blowers in the North American market. As part of the review, we have analyzed a variety of different tools and compared their functionalities. Building on this, we have selected what we believe are the best available devices and voted the best cordless blowers in 2018. Since there are significant differences between devices with different voltage ranges (e.g. 20 volts vs. 40 volts), we consider them separately during our reviews. Generally, we are aiming at selecting the best cordless leaf blower (as well as second- and third place winners) in each voltage category. In order to do so, we follow our three-phased review approach as presented on our homepage. In the following you will find the detailed report of our 40V cordless blower reviews for the year 2018. For a start, we provide a short overview of the best cordless blowers in the 40V category. Afterwards, the comprehensive description of review results follows. All in all, we collected data of 40V cordless blowers from the following tool manufacturers during our research work: Oregon, Dewalt, Ryobi, Black and Decker, Greenworks, Kobalt, Poulan, Worx, Craftsman, Troy-Bilt. After processing and analyzing the data, we nominated the following three 40V devices as our winners of the year 2018. 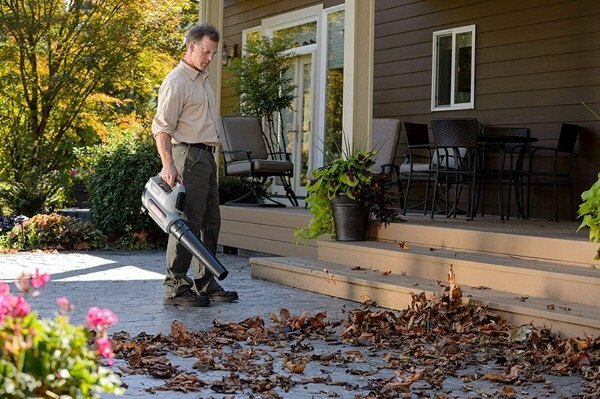 With an impressive overall rating of 9.0 out of 10.0 points, the Oregon 40V Max BL300 was selected as the best cordless leaf blower in the 40 voltage range. The device has an enormous power and is equipped with a variable speed trigger as well as a turbo button. It reaches a max. air speed of more than 130 mph and a max. air volume of more than 500 cfm in turbo mode. In contrast to most other high performance 40 volt blowers, the Oregon device is also pretty lightweight, weighting only 9 lbs incl. a 4.0Ah battery. Second place in the 40 voltage category goes to the Dewalt 40V Max XR. The 40V cordlesss blower generates an air volume of 400 cfm and air velocity goes up to 120 mph. A fully variable speed trigger allows to adjust the speed level as needed. Besides the device has an ergonomic design and fits well in the hand. On the downside, the tool is relatively heavy compared to other 40V blowers. The weight of the complete solution, i.e. incl. battery, is higher than 11 lbs when using the 7.5Ah pack as an energy source. The third best cordless leaf blower is the Ryobi 40V Jet Fan Blower. Its maximum air volume is 300 cfm. The velocity of the air goes up to 155 mph. And if that’s not enough, you can dissamble the blowpipe from the device in order to achieve an additional power boost. All in all, the Ryobi 40 volt blower is also pretty comfortable to handle. Even though, with its individual weight of almost 9 pounds, the tool is one of the heavier 40 volt devices which we investigated during our reviews. We will now go into detail with respect to our four review categories (e.g. performance) and corresponding review criteria (e.g. air speed). As a result, you will understand how our overall rating comes about. In addition, you will learn more about the specific strengths and weaknesses of the best cordless leaf blowers in the 40V range. 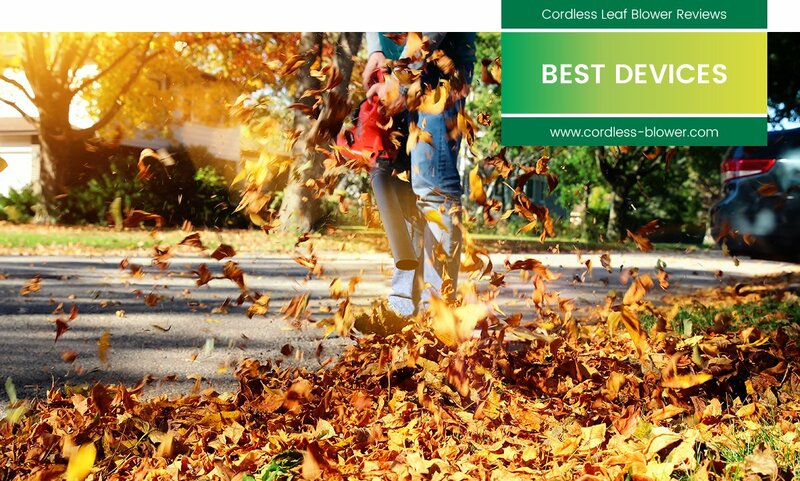 With 10 out of 10 possible points, the Oregon BL300 was selected as the best cordless leaf blower in the review category “performance”. The 40V devices from Dewalt and Ryobi each received 9 points. In the context of air speed, the Ryobi 40V blower clearly reached the first place with its air velocity of 155 miles per hour (mph). The 40V solution from Oregon also works very satisfactorily with an max. speed of about 130 mph. At 120 mph, Dewalt’s battery-powered leaf blower had the lowest max. air velocity. When it comes to air volume, the Oregon blower achieved the best result with more than 500 cubicfeet per minute (cfm). The Dewalt device also has good values at about 400 cfm. The Ryobi blower has a significantly reduced air volume at 300 cfm. All three selected cordless leaf blowers have variable speed triggers, which allow the users to adapt the blowing power according to individual needs. Variable triggers are usually used for longer run-times. In addition to the variable speed trigger, the Oregon 40 volt blower also possesses a so-called turbo button in case additional performance is needed. With the 40V blower from Ryobi, users can reach a performance boost by dissambling the nozzle. The Dewalt device doesn’t have any additional performance-enhancing features. In the review category „ergonomics“, the battery-powered leaf blowers from Oregon and Dewalt both achieved 9 out of 10 points. We awarded 8 points to the device from Ryobi. With an individual weight of only 6.2 pounds, the Oregon 40V Max BL300 is by far the lightest among the three reviewed devices. Incl. a 6.0 Ah battery, the solution only weights around 9 pounds. In contrast, the total weight of the solutions from Dewalt and Ryobi can be well over 10 pounds, depending on the size / weight of used batteries. With respect to handling, the three reviewed cordless leaf blowers convinced us more or less equally. At first, all of them are ergonomically designed. Besides, the devices have a balanced weight distribution, which allows to guide them easily and comfortably for longer periods of time. Additionally, all three 40V blowers have a convenient soft-grip, which further supports pleasant handling. In terms of noise, Oregon offers the best cordless leaf blower in our opinion. With a sound pressure level of max. 65 decibels (db(a)), the 40V device is very quiet, even quieter than some reviewed 20 volt devices. The noise level of the Dewalt device is pretty similar (67 db(a)). The Ryobi blower is much louder and has a noise level at around 73 db(a). In the third review category, we were impressed by Oregon’s innovative batteries and chargers. Hence we rewarded them with 10 points. Dewalt and Ryobi both received 9 points for their technology solutions. The Japanese company Ryobi has the largest range of lithium-ion batteries amongst the reviewed 40V tool manufacturers. In total, there are four different batteries with capacities between 1.5- and 5.0 Ah available for Ryobi. Oregon and Dewalt each have three different battery packs on offer. The capacities are 2.4-, 4.0- and 6.0 Ah (Oregon) respectively 4.0-, 6.0 and 7.5 Ah (Dewalt). As mentioned in the last section, the largest lithium-ion batteries of the three manufacturers have capacities of 5.0-, 6.0- and 7.5 Ah. The resulting amount of energy allows a seamless usage of the battery-powered leaf blowers at full capacity over a period of approximately 30 to 40 minutes. With smaller batteries (e.g. 1.5- or 2.4 Ah), runtimes are correspondingly lower. However, the average usage time can always be extended by controlling the power of the 40 volt blowers intelligently (i.e. only use the power button if you really need it, vice versa). In our opinion, Oregon offers the best 40V charging solution. The 2.4 Ah battery can be fully recharged in just 30 minutes; the charge of the 4.0- and 6.0 Ah batteries from Oregon also only lasts 60- respectively 90 minutes. Charging times for the Dewalt and Ryobi batteries are much longer, that means more than two hours for the largest packs. The introduced 40V battery- and charging technologies are not only compatible with cordless blowers, but also with other 40V tools of the respective manufacturers. If you want to use multiple devices of one manufacturer, it is important that the company has a good choice of 40V tools. This is the case for Oregon as well as for Dewalt and Ryobi. However, the latter have a particularly large and varied range of battery-powered garden tools. In the final review category „scope of delivery & price“, we have uniformly awarded the second-best value of 9 points to all three 40V cordless blowers. The 40V blowers from Oregon and Dewalt are available as packaged solutions on Amazon, that means together with battery packs and charger. The different components can also be ordered separately. For example if you already own batteries and only want to buy the battery-powered leaf blower. In the case of Ryobi, all components need to be supplied individually. At least, we did not find a combined offer while conducting this review. In terms of price, the three 40V solutions are approximately the same. However, since all of them are pretty powerful applications of high-quality, they are not cheap either. Prices start at $160-170 for the 40 volt blower only. They go up to $400 for the complete package, including a battery pack with the highest capacity and a charger. Nevertheless, in our opinion all three solutions have a good price / performance ratio as a whole. Last but not least, the table below illustrates the most important technical device data, which we collected in context of our review and used as input for our analysis and evaluation. * Battery run- and charging times were partially calculated.